You CAN search library databases from off campus! You can search library databases from off campus! Just start at the library site: http://go.middlebury.edu/lib. JSTOR, ebooks, audiobooks, Summon and all of our online journals, magazines and newspapers are there for you…no matter where you are! 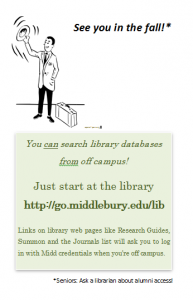 When you’re off campus, links that are on library web pages (for example, Research Guides, Summon and the Journals list) will ask you to log in with Midd credentials. It’s as easy as that! Seniors: Ask a librarian about alumni access to library databases! This entry was posted in libspotlight, LIS Staff Interest, Post for MiddNotes, Post for MiddPoints and tagged Library Spotlight on May 20, 2015 by Carrie Macfarlane. Is it possible to browse the browsing shelf online? It seems as if it should be possible since one can browse shelves by call number, but i can’t figure out how it might be done. Thanks. Good question! I love the browsing collection too. I’m looking into this and will get back to you soon!